At Northeast Delta Dental, we understand some patients need more dental care than others. That’s why our industry-leading Health through Oral Wellness® program can provide additional benefits at no additional cost to at-risk patients from participating employer groups with HOW plan designs. All they need is a little help from YOU. Through the use of an online risk assessment tool called PreViser, you can help your at-risk patients receive the care they really need. HOW can help you improve patient acceptance of treatment, their oral and overall health, and your bottom line. Register here for your PreViser account at no cost to you. Looking for dental benefits for yourself and your family? Click here to learn more about our new dental plans for Individuals and Families. 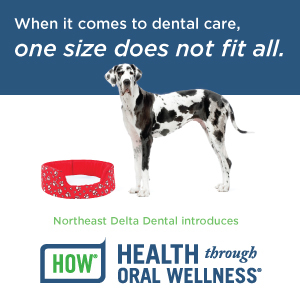 Northeast Delta Dental administers dental benefits to more than 880,000 people in Maine, New Hampshire, and Vermont and designs programs for organizations of all sizes and people with no access to employer–sponsored dental insurance programs. We offer two plan types for employer groups. Our Small Group Options are designed for groups with 2-100 enrolled employees, and offer both flexibility and affordability. And with the added benefit of being part of a community-rated pool with thousands of other members, employers and employees are also assured of long-term rate stability. Dental Plans for Large Groups is for employer groups with 101+ or more employees. Northeast Delta Dental offers plan design flexibility. From fully insured to self insured, we have a plan that will work for you. Learn more about our Small Group Options or our Large Group plans. Northeast Delta Dental has joined with EyeMed Vision Care to provide our customers with a comprehensive vision insurance product, providing access and choice of providers that today’s consumers demand. DeltaVision is a new tool to provide employee benefits that contribute to the overall health of those we insure. Visit DeltaVision for more information on this benefit. You're probably aware that candy leads to cavities and sugary drinks can also cause decay. But cough syrup? Unfortunately, it's true – certain syrupy medications can cause tooth troubles, especially if they're consistently taken over a long period of time. Learn more in our informative article; Colds, Coughs ... and Cavities? Northeast Delta Dental proudly announces Grin for Kids, a special edition of our Grin! Magazine. Grin for Kids features a variety of helpful and educational articles centered around the importance of good oral health for children. From a fun, healthy recipe to craft projects you can do with your children, there are plenty of kid-friendly activities within Grin for Kids that will help you have conversations with your children about the value of a healthy smile. Check out the issue today! Take control of your oral health today! Put your smile to the test. Visit myDentalScore. At Northeast Delta Dental, we are passionate about oral health and its importance to families. For almost 50 years, we have worked to improve oral health and hygiene by emphasizing preventative care. Our oral health and wellness section provides important information about adult oral health, children's oral health and even oral cancer. Learn more about Oral Health & Wellness.